Silversea Cruises’ Silver Whisper sailed from Rome this week on her first voyage following a successful 14-day dry-dock project in Genoa, where extensive renovations were made to most areas of the ultra-luxury ship. The enhancements aboard Silver Whisper represent our ongoing commitment to delivering a luxury travel experience that is unsurpassed, said Amerigo Perasso, Silversea’s president and CEO. We made a significant investment in this renovation to ensure our guests continue to enjoy the very finest comforts and amenities in a totally refreshed and updated shipboard environment. New Look for Suites: All carpets, headboards and curtains were completely replaced. The sofas and chairs feature new upholstery. Each suite has a new mattress custom-made exclusively for Silversea. The mattress features an individual spring system with a soft and firm side that can be reversed to suit each guest’s preference. There is also a new memory foam pillow top that covers the mattress when configured as a queen-sized bed. And in the larger suites (Owner’s, Grand, Royal and Silver), the veranda furniture was replaced and a new state-of-the-art home audio system added. The Owner’s, Grand and Royal Suites are outfitted with Bang & Olufsens’ BeoSound 3200 radio and CD player, and the Silver Suites have BeoSound 1, which features a CD and radio integrated into a speaker. 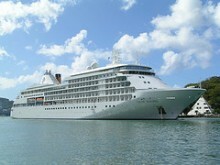 By mid-June, all suites will feature new alarm clocks with iPod docks—as will all ships in the Silversea fleet. Refreshed Public Areas: La Terrazza, the Panorama Lounge, Reception area, Spa, Card Room and Conference Room received new upholstery, carpeting, curtains and wall treatments. New carpet was laid in the Observation Lounge and new wood flooring in the Spa. The Restaurant’s hardwood floor was completely reconditioned and polished and the chairs dressed in new upholstery. An upgraded sound system was added to the Show Lounge, Panorama Lounge and La Terrazza. New carpet was installed in all corridors, landings and staircases. Upgraded Outdoor Spaces: The jogging track features all-new artificial turf, and the pool area has been outfitted with new deck furniture, plus a new sound and light system for evening entertainment and outdoor shows. The pool itself has been upgraded inside and out with new tiles. A large awning was installed over the outdoor dining section of La Terrazza. And the Pool Grill, sporting a new awning as well, will become The Grill for evening dining featuring the popular new Black Rock cooking concept that debuted aboard Silver Spirit. In addition to enjoying a fresh reconditioning and polishing of teak decks and woodwork, the ship underwent thorough maintenance on mechanical and propulsion systems. Silversea Cruises is recognized as an innovator in the luxury segment, offering guests large-ship amenities aboard its intimate, all-suite vessels: Silver Cloud, Silver Wind, Silver Shadow, Silver Whisper and Silver Spirit—all designed to offer an atmosphere of conviviality and casual elegance. With the inclusion of the regal expedition ship Prince Albert II, the company’s itineraries encompass all seven continents. For more information please contact Deluxe Cruises.